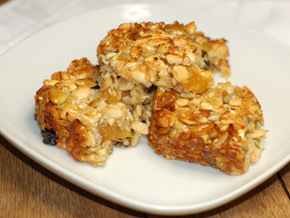 These home made breakfast squares are a more natural alternative to bought bars. They are rich in anti-inflammatory seeds shown to have cancer preventing properties. For a low GI breakfast on the go eat one of these squares and two pieces of fruit. Drink plenty of water after eating the bars as it will help your body to absorb the nutrients in the seeds. First put the flaxseed/linseed and sesame seeds a small bowl with the water and leave them to absorb the water whilst preparing the other ingredients. Mix all the other ingredients, apart from the butter and the honey, in a mixing bowl. 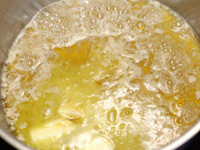 Put the honey and the butter in a saucepan and slowly bring to a simmer. 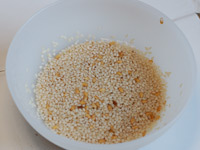 Add the seeds to the main mixing bowl and stir them, then add the whole lot to the saucepan. 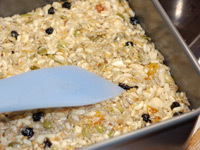 Spoon the mixture into a greased non-stick baking tray and make flat with a spatula. Cook for 25 minutes at 205°C/400°F/Gas Mark 6 or until it is brown on top. Once cooked allow to fully cool, cover and refrigerate for 1 hour then cut into 16 squares. Keep covered in the refrigerator for up to two weeks.